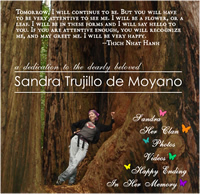 I’ve never met Sandra, but what is so clear from her website is the wake of love that she left behind in so many she’s touched. Thanks for sharing a bit of her life and lessons with us. Such a beautiful, and rare story. Very inspiring. Thanks you for this post. I couldn’t help it, I have linked to Sandra on my blog.